China has taken drastic action to keep the poverty-stricken Tibet Autonomous Region (Tar) free of the deadly Sars flu virus. Foreign travellers are banned, international flights have been halted and internal Chinese flights cut back. Trucks face road blocks on their long journey to the Himalayan plateau and international observers have reported restrictions on traffic moving into and inside Tibet. China's leaders will suffer "a great loss of face if they fail to look after the Tibetan people," says Thierry Dodin, director of the Tibet Information Network (Tin), an independent news monitoring agency. But Beijing faces a tricky balancing act. Tibet's roads are so often impassable that any prolonged slowdown in trade in the summer months risks creating shortages into next year. One Chinese mountain guide who recently travelled the highway linking Tibet to neighbouring Sichuan province told BBC News Online he had passed three roadblocks staffed by doctors with thermometers "to check the fever". China's Premier Wen Jiabao has warned of catastrophe if Sars takes hold in rural areas with inadequate healthcare. 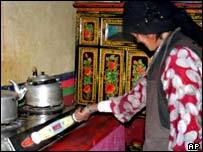 Tibet's primitive clinics, often lacking electricity or drugs, have earned the region priority treatment. Beijing is certainly tackling the job of keeping out Sars seriously. Foreigners already in the Tar were quarantined in their hotels before being given permission to leave, China's official Xinhua news agency reported. Chinese tourists who flew in hoping to evade Sars were turned back, according to Tin. A few backpackers have continued to arrive. "You can get into Tibet, but you cannot get registration in the hotel," said an official of the Tibet Tourism Corporation (TTC) who did not wish to be named. "It is forbidden until August," the official added. That would amount to a three-month ban, far longer than the suspension for May that China's National Tourism Administration (NTA) has publicised. The TTB official said hotels are empty but state-run ones are still paying wages - something Premier Wen has since urged state firms to do. But one receptionist contacted by News Online was less confident: "We don't know yet," she replied when asked if she would be paid for May. May to September is peak season for tourism, which makes up about 1bn yuan ($120m; £75m) of the region's 15.8bn yuan gross domestic product, official data shows. The travel ban has also hurt tour firms in Nepal and in China's Sichuan province. Local guides say many Sichuanese tour office workers have been laid off. 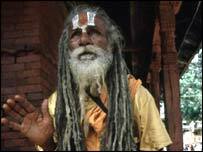 Nepal's situation is less drastic. The country earned $140m from tourism in 2001, equal to 4% of the economy. Long-haul tour operators are still flying into Kathmandu, but Indian pilgrims who traverse Nepal each summer are not coming, says Nandini Tapa, Nepal Tourist Board's manager for Europe and the US. They form one third of Nepal's Tibet-bound tourists, often journeying in big family groups to Asia's holiest mountain, Mount Kailash, sacred to Hindus and Buddhists alike. They are "all sorts, but broadly the Indian middle class market," says Ms Tapa. "That route is really closed, so we hope it's just a temporary situation," she says. Trucks are still moving, as the country exports rice and flour to Tibet. "Definitely there are some restrictions but the border is not totally closed," says the BBC's Sushil Sharma in Nepal. Three-quarters of Tibetans are herders and farmers, so the immediate economic shock to the Tar is being felt hardest by Chinese settlers and migrant workers. But the longer-term impact of even a partial blockade of transport could be serious for everyone. The Tar relies on importing rice, fuel and other essentials such as medicines. Stockpile levels are a state secret, says Mr Dodin. "You can be sure the army has lots of fuel reserves, whether they make them available to the population is another matter," he says. 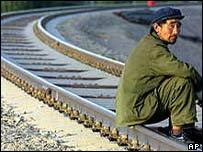 The Tar's economy is growing rapidly - 12% in 2002 - helped by Beijing's emphasis on developing poorer inland regions. 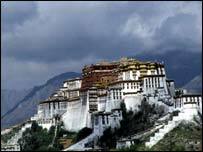 But the high life in Lhasa depends on imports and state expenditure. Infrastructure spending by government departments powers growth, and a construction boom which relies on tiles, glass and cement from outside the region. In 2002, the tertiary sector - trade, finance, services and government - was about 50% of the economy, with manufacturing and agriculture in a lesser role. By contrast, manufacturing has the biggest slice of the economy in China as a whole. Chinese heavy-handedness in Tibet is often criticised by international observers - including Tin. But in this case, "I know that the local population is quite happy about it," says Mr Dodin.